Naturally, the New York Times headline, "Skiers Buy Vacation Homes as Prices Fall" caught my eye yesterday. This makes sense because, besides skiing and running my consulting business, I also work as a real estate agent and business broker in the resort Village of Lake Placid and the surrounding upstate New York region. I am affiliated with the Prudential Terry Horrocks Agency on Main Street in Lake Placid; the Olympic Village. The Times article hit at a perfect time; I was just getting ready to write about a wonderful ski home I have listed for sale, just a few minutes away from Whiteface Mountain. Whiteface Mountain, by the way, is where the 1980 Olympic Winter Games alpine events were held, and where a member of the this year's United States Olympic Alpine Team trains and learned to ski. Oooops - skiing tangent. Sorry, I'll get back to the topic at hand. But first, let me explain. This blog and all the great information it contains, especially the real-time Adirondack ski and skiing conditions, is sponsored by me. Therefore, I get to do an occasional commercial about the topic of my choice, just like on Tee Vee. If you read to the end of this post, I promise you will find a hot-off-the-press ski report. Once again, a major newspaper with plenty of sponsors and advertisers to pay reporters helps me make my point. Now is the time to buy a second home in a vacation paradise like the Adirondacks. If you are looking for a spot from which to base your outdoor adventures and still earn a living, I have the perfect home for you. 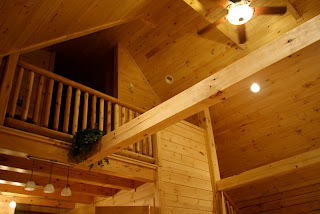 Located in Jay, New York, this new log home is aesthetically pleasing and super high-tech; a great combination. It is incredibly energy efficient, features in-floor radiant heat system, hardwood and tile floors, a jacuzzi 2-person tub, and a beautiful wood stove. Here's the cool part: it is pre-wired for smart appliances, and already has CAT6 industrial grade communications cable, and a multi-line telephone system. Clearly, this is a telecommuter's dream come true! The spacious kitchen has maple cupboards and the best appliances available. Maybe this is the cooler part: the house is only minutes from Whiteface, the AuSable River, and miles of hiking, and it was thoughtfully and meticulously built with durability and energy efficiency in mind. This is the perfect property for active people who need technology too. Check it out on my website if you are interested. Ski report time!!! Unlike my white birch tree, skiing survived Monday's warm rain storm, but barely. The positive spin on the Adirondack backcountry is we now have a very solid base as a result of the rain and subsequent sub-zero temperatures. Until we get some serious snowfall however, the backcountry will be sketchy. Mount Van Hoevenberg and Whiteface are both in great shape. I admit this is indeed remarkable considering how much rain we received. I skied at Whiteface on Wednesday and thanks to the wonders of technology and man-made snow, had a great day skiing. Mount Van Hoevenberg received 6 inches of fresh snow and was beautifully groomed today. The skiing was wonderful aside from the -25 wind chill temperatures. Bundled up and skiing, my hardy Adirondack friend and I called it 'forced intervals' since it was not a day to dally and the hills on the Porter Mountain Racing Loops were a welcome and warming challenge.